The third-generation Chromecast leaves Google out of the cheap 4K streamer wars. Google is updating its $35 Chromecast dongle with a fresh design and better performance, but not 4K video. The third-generation Chromecast is 15 percent faster than its predecessor, and it supports 1080p video at up to 60 frames per second. (The second-generation Chromecast only supported 1080p video at 30 frames per second and 720p video at 60 frames per second.) While most movies and TV shows play at 30 frames per second anyway, the higher framerate could come in handy for some YouTube videos, live streams, and sports broadcasts. Unlike Amazon’s Fire TV Stick and Roku’s Streaming Sticks, Chromecast does not include a remote control or TV-based menus. Instead, you must use a phone, tablet, or laptop to launch videos from supported apps. If you have a Google Home speaker, you can also launch videos on Chromecast with hands-free voice commands. 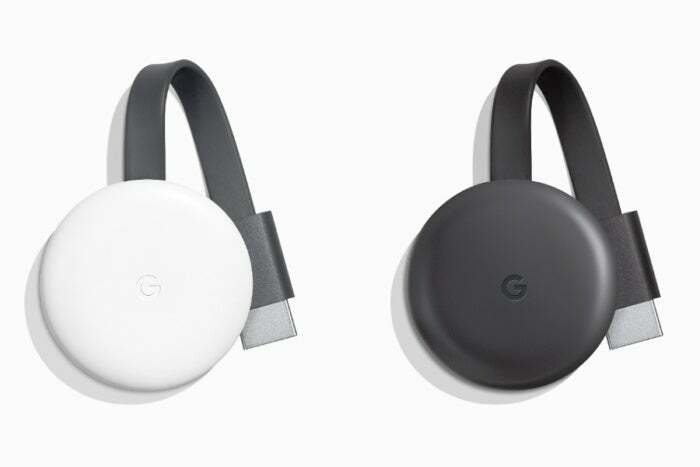 The new design comes in white or black and has a plumper look than the old Chromecast, but it’s still a circular pendant that hangs away from the television on a short built-in HDMI cable. Chromecasts can also stream music from services like YouTube Music and Spotify, and Google says it will add multi-room audio support later this year. This will allow Chromecast TV dongles to finally sync up with Google Home speakers, Chromecast Audio devices, and speakers with Chromecast-built-in. As Variety reports, FCC filings have indicated that the new Chromecast supports Bluetooth and has better Wi-Fi connectivity with 802.11ac. Google isn’t commenting on those additions right now, though it’s possible that the new Chromecast could gain new Bluetooth-related features over time. Rumors had also suggested that Google would offer a “Smart TV kit” bundle with Chromecast and a Google Home Mini speaker. Google didn’t announce anything of the sort, though you can still get the second-generation Chromecast and a Home Mini for $74 from Walmart or Best Buy. The impact on you: It’s a bit surprising that Google didn’t add 4K HDR streaming to Chromecast or at least lower the price of the 4K HDR Chromecast Ultra, which still costs $69 two years after launch. Over the last few weeks, Amazon announced the Fire TV Stick 4K for $50, and Roku announced its own cheap 4K HDR streamers (the $40 Premiere and $50 Premiere+). Those devices also include proper remote controls and on-screen menus, as does the Xiaomi Mi Box S, which offers Chromecast capabilities and a full Android TV interface with 4K HDR for $60. Chromecast still has some virtues—it’s simple to use and plays nicely with other Google services—but it’s no longer winning on value alone.